As you may know, members of University and College Union (UCU) are currently involved in a dispute with university employers which has resulted in us having to engage in industrial action including strikes. You may be concerned about the impact this is likely to have and so we want to explain what is happening and why. insecure employment is a massive problem with 75,000 university staff on 'casualised' contracts (over 21,000 staff are on zero hours contracts). gender inequality is a serious problem with male university staff earning on average 12.6% more than female counterparts. since 2009 the value of our pay has declined in real terms by 14.5%. vice-chancellors are paid 6.4 times more than the average member of staff. Why are university staff taking action? This is not a decision we have taken lightly. Every day we work hard to educate, support, develop and improve the life chances of 2.3 million students. No UCU member wants to harm our students' education. However we cannot sit back and watch our pay eroded, inequality grow unchallenged and employment become more insecure every year. As tuition fees continue to rise you may rightly wonder where the money is going. The sector has over £1 billion in operating surpluses. Universities are spending lots of money on buildings and increasing revenues. They are not investing in their staff. We know this action will cause disruption and we are sorry. The truth is that university employers can end this dispute today. Please help us to get the universities back round the table and end this damaging dispute before it gets any worse. if you are a student talk to your students' union about how you can get involved in supportive activities. Speak to your lecturers and other staff and let them know you support them. It is the staff and students who make a university. 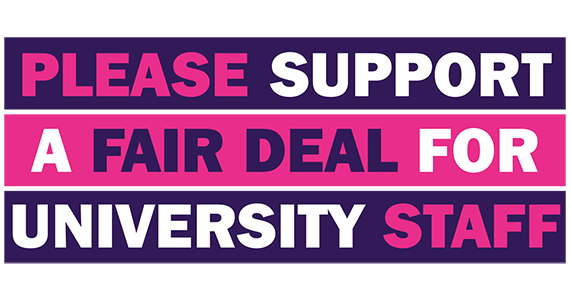 Please support our campaign for a fair deal. For further information please contact your local UCU representative.